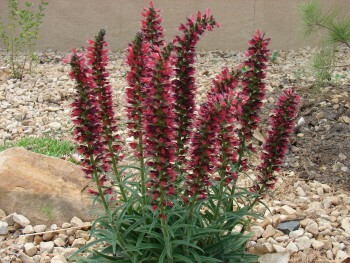 Red feathers (Echium amoenum) is one of the most interesting perennial introductions in years. It has a very structural, architectural quality to it, with straight flower spikes somewhat resembling our native Liatris punctata, but blooming much earlier in May. I’ve combined the unique russet-red flower spikes and growth habit of red feathers with the bright yellow flowers and low spreading habit of Genista lydia. In another garden I have it with a prickly pear cactus variety named ‘Claude Barr Plum’. It’s also a beautiful accent for other, more water loving plants, such as Purple Smoke Bush (Cotinus coggygria). The spikes will reach a height of about 14 inches. I’ve never had any blooms lean or flop over unless the plant is actually stepped on (it happens!). It has a tuft of dark green basal foliage that only reaches about 8 inches across. It will rebloom throughout the season if the old flower spikes are removed. Red Feathers has been in one of my gardens at Legacy Ridge Golf Course in Westminster since 2006. While it doesn’t seem to be strongly perennial, it does reseed occasionally, so you may want to leave a couple of spikes of flowers/seeds to mature. Red Feathers is from the Caucasus Mountains. It will tolerate a wide variety of conditions. I grow it in a heavy clay soil amended with sand and pea gravel. The garden is bordered on one side by a rock wall, one side by a sidewalk and the other by asphalt. Through the summer months it is watered about once a week, otherwise the clock is off and it is watered on an “as needed” basis. I grow it in full sun. It will tolerate partial shade and it will also tolerate more water. Red Feathers will be a great addition to your garden! View the plant profile here or see the video here. Thanks to Shalene Hiller, City of Westminster, for writing this piece. I love this plant. I have two, and would like more. Do seeds need to be stratified or over-wintered to germinate? Thanks! The seeds will germinate in the same year if conditions are right. You will not need to hold them over winter. Enjoy!